So I never really made a drawing topic here, but now I'm here correcting that, so it's all good. 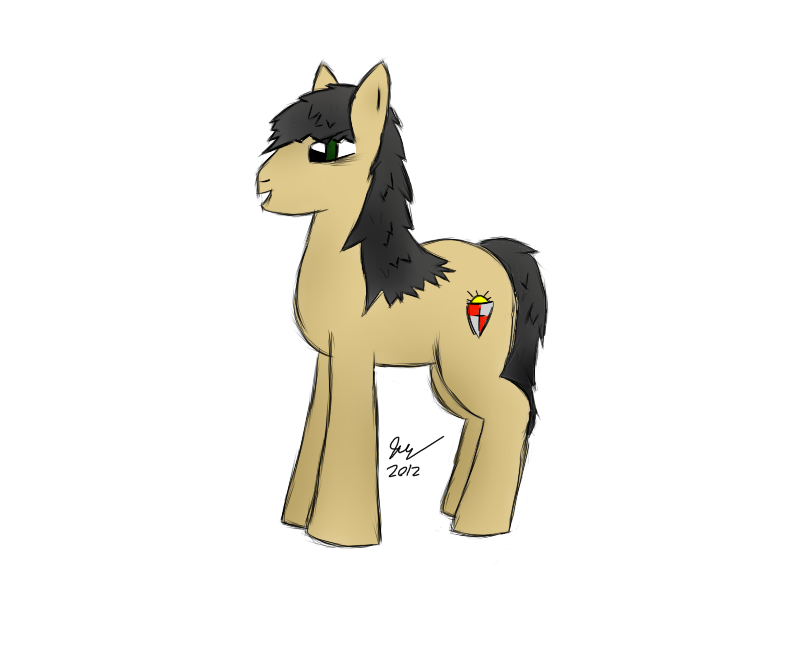 Pony OC to begin, why not? Not too shabby there, bud. Soon, I hope everyone on VGF will have a drawing topic. 'S that Flash you're using? I've seen this on dA already. It's not bad, but that anatomy's kinda wonky. For example, the snout seems to be positioned too low on the face, and the front legs in that first pose look stiff and detached. You should try using a reference next time. That said, I like the style it's in. Valigarmander wrote: 'S that Flash you're using? A little sorta practise with a kinda difficult pose. The arm on the left looks wonky, I know. I hope next thing I draw comes out a bit better. That's pretty cool, I really like that you filled in the background and the whole frame. If you want any help with perspective stuff or proportions in general, let me know and I'll be happy to sketch out some changes and explain how it's done. I would love some help with proportions. Garlandom User wrote: Nah, I'm using SAI. You got some nice stuff there. I can also help if you need tips on stuff like foreshortening and implied action. Well, depends on what you're shooting for. AI can help you with the realism aspect; I specialize in cartoons. 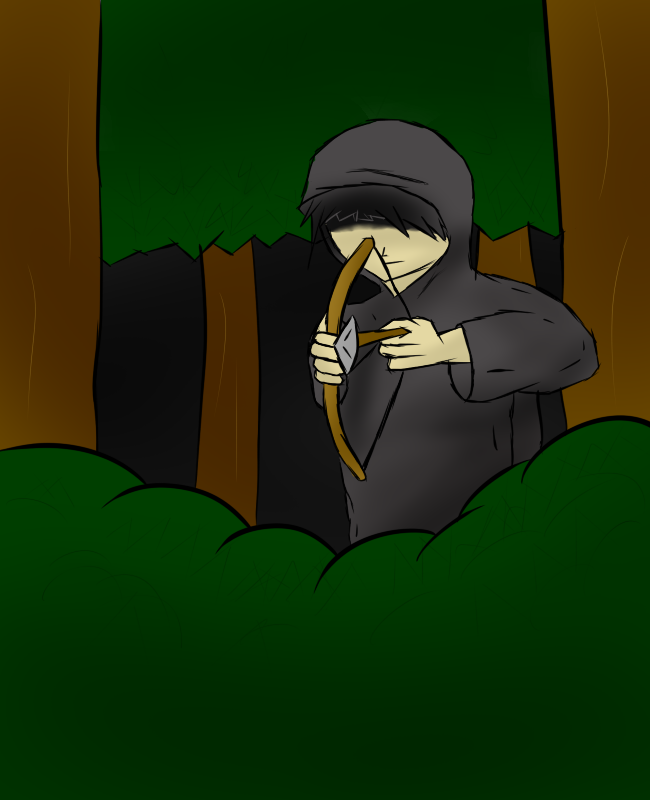 Firing an arrow while your bow-hand is touching it is incredibly painful. Antisocial wrote: Hello, fellow user! Oh you. I can do cartoon stuff easily, I just find it a bit flat. Any help is welcome, really. Foreshortening and implied action especially, because I really want to get better at that kinda thing. I will try to remember to put some time aside to work stuff out, I've got my day job that wraps up on Wednesday because school is out for summer here after that should be tons of time. Take your time. Thanks again, man. A friend wanted me to make them a pony, so here's what I made 'em. It also occurred to me that signing these things would be a good idea. ^ Not bad. Did you look up any reference material? Looks a bit like you would benefit more from trying to break down the individual elements in the MLP stuff. The net makes it so easy to look up how they do hair, etc, that I think it could be a real help if you try to examine the specific shapes they're using. I'll try to break the profile into basic elements for you so you can see how the proportions come together better. Garlandom User wrote: Take your time. Thanks again, man. Actually working through Friday, it turns out, despite the rest of the staff finishing today. Go figure. Things I will note about the form: The nose angles down from about 1/3rd of the way up from the bottom of the head. It has a arc on the underside that links in smoothly to the curve on the right side of the head's circle. The back side of the ear also links in smoothly to the right side of the head, as though they are part of a much larger circle. You might be able to draw out a broader curve around the circle, like a circle set into a crescent shape, to give yourself an idea of the relation between the ear and the bottom of the nose/mouth. The eyes are actually concentric ovals of about the same width and height. They actually skew low, so more space is left open on the top of the iris in comparison to the bottom of the iris. Feet that are pressed against the ground go flat on the bottom. Ones that are raised up in the air droop down with a curve on the underside, as though they are soft or limp. The neck is actually a tall oval shape that the outer contour of the hair adheres to. 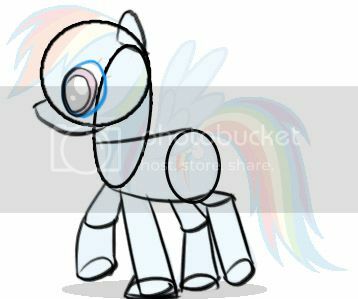 Because MLP is made in flash with vectors, basically all of the art can be broken down into shapes like this. It might seem technical or like a simplification, but that's how artists are able to create many frames in a short amount of time, as the individual elements are actually being rotated and resized as the character moves. In the animated GIF I linked, which was pulled from the actual show, you might notice that while the tail appears to droop while RD walks, it's actually just a separate element being rotated, or see-sawing in time with the gyration of the character's step. I did look up a reference for it, but only used it briefly. Since apparently most of my friends want me to draw them their pony OCs, I'll see what I can do with the next one. Also, you guys are the best. More help has been given to me today than I've ever gotten elsewhere to be honest. No prob mate, happy to help you. Will still try and address that other image a bit to break it down into a few simple points you can learn that will help and don't depend on near perfect knowledge of technique.